FERRARIO - [ Chilean indians playing ciueca ]. FERRARIO, G. - [ Chilean indians playing ciueca ]. [ Chilean indians playing ciueca ]. - FERRARIO, G.
Title : [ Chilean indians playing ciueca ].. Size : 5.9 x 847.0 inches. / 15.0 x 2151.5 cm. 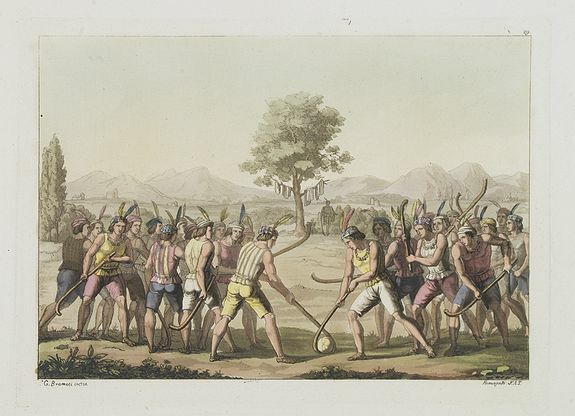 Description :Aquatint depicting Chilean indians playing "ciueca", a native hockey-like game. Condition : Very good condition. This aquatint engraved plate was color printed on fine move paper with additional hand-coloring.